The Purdue Outing Club Adventure Race (POCAR) is a unique event. 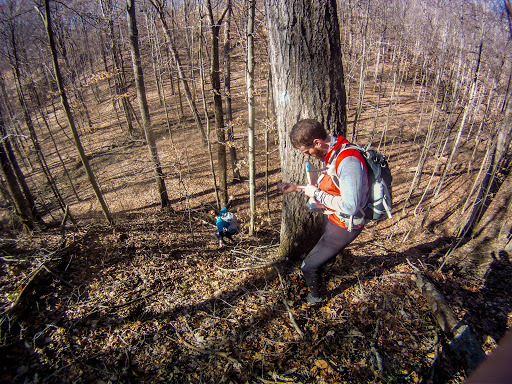 It gives teams of 2-6 people 48 hours to locate an unknown amount of checkpoints on foot in the Indiana woods, using only a map and compass. The checkpoints are only revealed once the race clock has started, and usually only some of them. 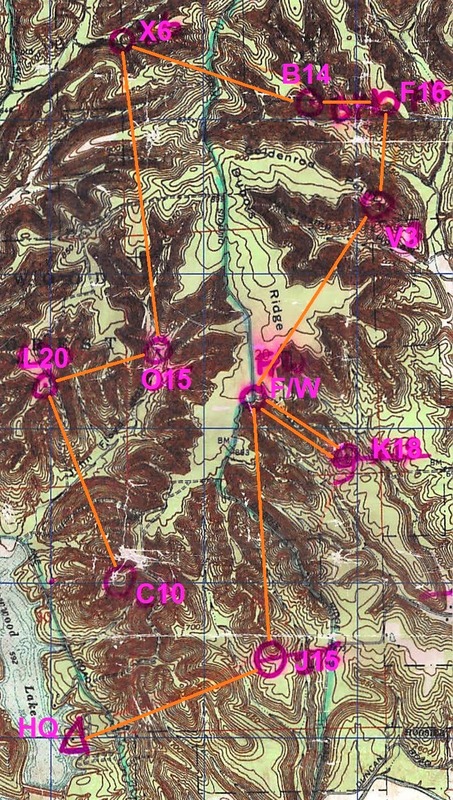 Teams have to plot their course on the fly and adjust for additional checkpoints to be handed out as the race progresses. 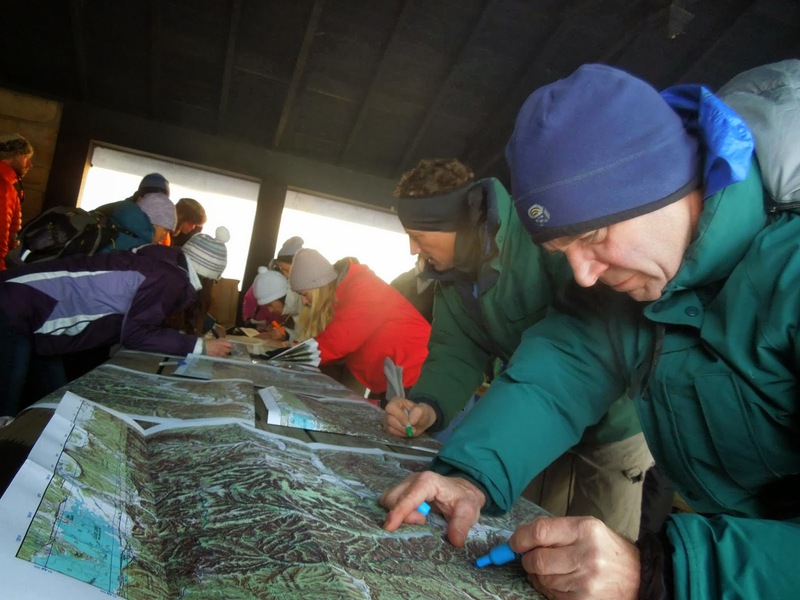 Some teams choose to use the entire 48 hours to find all the checkpoints, perhaps even carrying camping gear with them to sleep out in the woods. My teammates and I were planning to finish the course as fast as possible, without any sleep, a task we estimated could take up to 24 hours and covering 50+ miles on our feet. Who were my teammates for this awesome event? 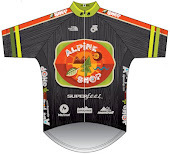 This year, Alpine Shop was invited to join up with our friends from Bushwhacker Adventure Racing. As I've mentioned before, normally we only get to hang out with these fine folks in race situations, when we're trying to grind each other into a pulp. But since this is an early-season, laid-back event, the fine folks at Bushwhacker reached out to us and asked if we would want to do POCAR together. Of course we would! Originally, Jeff, David and I planned to join Fredrik, Rachel, and Mike to make a team of 6, but Fredrik has some work commitments and couldn't make it. So that left the five of us to represent our combined teams, hilariously named Al's Bush Shop for Whackers for this fun event. David and Jeff marking up maps with out-of-bounds and important roads. Jeff, David and I drove over to Bloomington, IN on Friday night and met Mike and Rachel at our luxurious cabin located really close to the Race HQ in Yellowwood State Forest. We all brought our gear inside and started comparing clothing and food notes. It's really wonderful to race with new people because it means new perspectives on race strategy! We also compared notes about our competition tomorrow, and realized we had a target on our backs placed there by Indiana orienteering stud Mattias (US Night-Orienteering National Champion) and his team of Russians and Sedges. Wait, sedges? Damn you, autocorrect! Garrison's phone meant SWEDES! But that gave us our first race joke and that team will be hereafter referred to as The Sedges. Race morning was like any other, except noticeably colder, as we all drank our coffee, packed our stuff, and crossed our fingers that we would be returning to the cabin tomorrow morning with enough time before checkout at 11:00am. Once we make the short drive to Race HQ, we collect our maps and mark them up. We've been assigned to the first start wave at 0900. Like every race, we all seem to be consumed with details until the very last second, and then it's time to start POCAR 2014! The race starts on the honor system, no official "horn" or "go", just the race director trusting that only the teams with the 0900 start on their envelope will open them and start plotting. We are a trustworthy bunch, so at 0900 we run from the headquarters to the back of David's minivan and start plotting our 6 points on to each map. Once that's done, Rachel hustles us through final gear prep and we run out of the HQ area about 0915. There is a nice bit of road running to start, and we are all thankful to warm ourselves up a little. 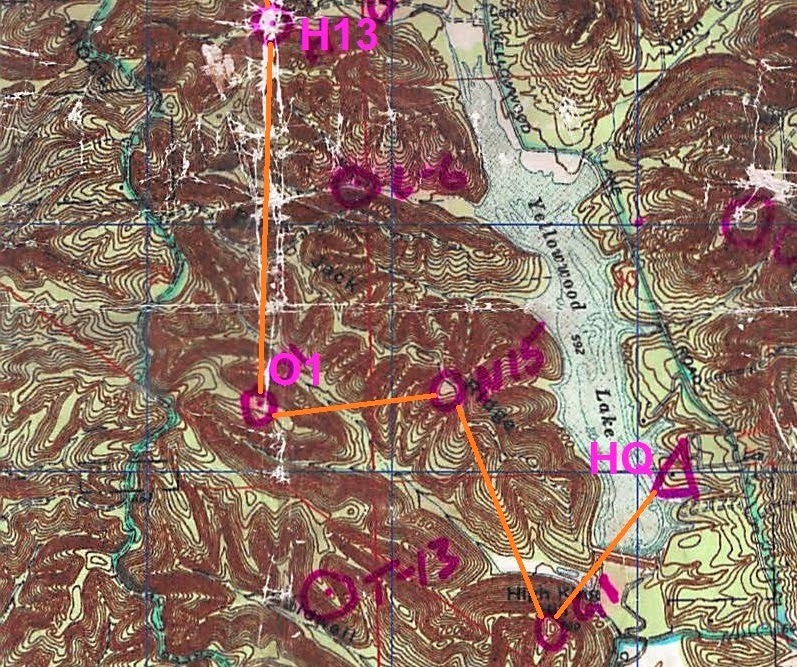 We attack F15 up the big spur off the road, find it cleanly, and then retrace some of our steps on the way to T13. We are able to cheer on a couple other teams in the area including Monkey's Fist! Whoop! We then descend into a major reentrant, "Cablewell (??) 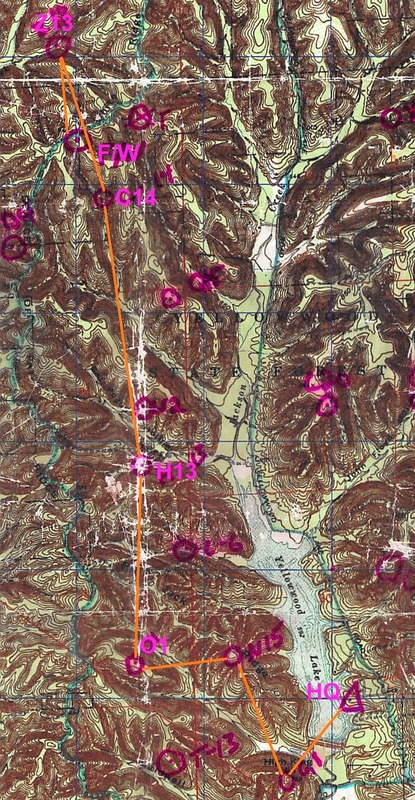 Hollow" on the USGS map, and then climb back up the north side. Once we crest the ridge...BOOM...T13 is right there. Garrison led the exceptional nav on this leg, and I know we're in the hands of two extremely capable navigators. This. Is. Awesome!!!! Our routes to L6 and U2 are also exceptionally clean, with David and Garrison working really well together to choose highly efficient and accurate routes. We all take extra time here and there to adjust layers, and I borrow Jeff's extra pair of homemade hand-tubes, they are awesome! Rachel and I use this time to catch up on adventure racing girl talk, a luxury we don't hardly ever get. Not that racing with boys all the time is a bad thing AT ALL, it's just fun to have another girl to talk to. I am getting really wrapped up in a story that involves "feelings" and "it's complicated" and "but I just don't knooooowwwww" as we make the climb up to Q15, I think even to the point where we distracted Garrison from his navigational duties. And then, where the control should be, there isn't anything. What the what? I feel really bad about distracting the team from the race at hand! We fan out all over the ridge, double-checking the features (where the ridge splits to the southeast, the secondary hilltop to the northwest, the minor spur to the west, etc. ), and confirm that we are indeed on the correct hilltop where Q15 should be. Gahhhhh! We decide to bail to the Fire/Water Station and inform the race staff of the misplaced control. Once we get there, we realize that there's a Radio Station, AND a Fire/Water Station, and neither of them are as shown on the map. Double gahhhhh! The race staff doesn't believe that Q15 is misplaced because they "set it with a GPS in the correct spot". Oh, if I had a nickel for every time a race director said this! GPS is NEVER the right way to set an orienteering course! We decide to let them hash it out over radio with HQ while we go get D4, the last remaining control on Leg 1. D4 is an easy out-n-back with mostly road running, but as we attack the control from the highly visible private property line, the flag isn't there. Not again! Triple gahhhhh! We descend into the reentrant junction just to be sure, and, nothing. We even check the next junction downstream, but nothing there either. Instead of wasting more time, we climb back up to the road and return to the Fire/Water Station to see what the race staff says. It's really hard to convince them that not 1 but 2 checkpoint flags are missing, especially since we are the first team to have attempted both of them. We discuss this a little bit and they finally agree to give us the Leg 2 cluesheet. Just as we're finishing up plotting the next 6 checkpoints, Mattias and the Sedges show up, reporting the exact same thing, that Q15 and D4 are missing. They started in the 0930 group, so they have a 30 minute time advantage on us. We are not happy to see them so close to us in the race, but are relieved to hear that they had the same issues. We run out of the Fire/Water Station with renewed intensity and purpose to push hard on Leg 2. We run out of the Fire/Water Station on a mission...get away from the Sedges! 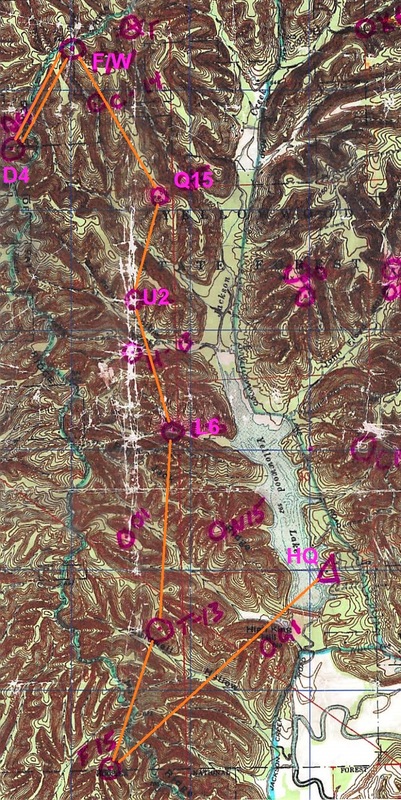 The first control, Z13, is a quick out-n-back with a healthy climb, and we see the outbound Sedges on our way back, which keeps the pressure on. We fly back through the Radio Station and down the spur towards C14. I mention to the team that I thought the pace on Leg 1 was pretty easy and that we should really run hard on this leg to get a gap. Garrison gives me a look like "oh, you thought that was easy, that's cute" and takes off down the creekbed. Jeff stops briefly to punch C14, and Garrison stops briefly to help a confused team, and the rest of us continue bashing through the underbrush at a wonderful pace. This is what I absolutely LOVE about adventure racing - friends running through the woods together. We have a long leg to H13 but choose to take it mostly redline, which means a fun climb! We are all feeling really good at this point and it seems that finally I've got my layering strategy under control. We've all taken a few extra minutes here and there throughout the day to make sure we aren't sweating too much or getting too cold. In these conditions (temps from 15-30F, with snow in the overnight forecast), we need to be extremely vigilant to make sure we don't soak through our current layers, because we aren't carrying much extra and only have plans to stop once more at the HQ. We are also being careful about our calories, sharing them amongst the team whenever one person is eating. This is another reason why I love racing with new teammates - new menu items! The rest of Leg 2 isn't really anything exciting, besides keeping score of how many times each of us wipe out on the slippery downhills. We just keep eating, and talking, and laughing, and navigating, and enjoying ourselves while keeping our foot just slightly on the gas to build our gap over the Sedges. The final checkpoint is on probably the highest point on the map - a big hill called High King Hill. It's a large mamba jamba, but I'm totally loving the climb and the company. And the fast descent straight back down and into HQ. We turn in our passport to the race staff and they give us an incredulous look, "You're done? With BOTH of the first legs? You're hours ahead of our schedule!" Well, as David put it earlier in the day "We're pretty good at this stuff" and we are given the final set of checkpoints as the race staff scrambles to get volunteers in place for Leg 3. 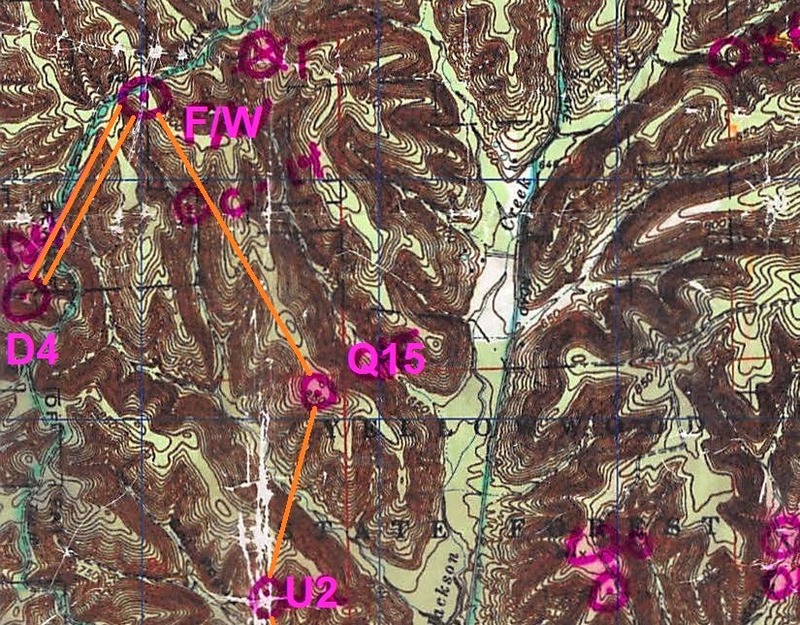 The race director confirms that this is the last section of the race, and gives us the mystical warning to "pay attention to all written instructions at the checkpoints". Hmmmmm. We are given a passport with spots for 10 punches, and coordinates for 8 checkpoints. We are told that we will receive instructions for the remaining 2 checkpoints (C10 and A9) out on the course. We reload our pockets with delicious treats and head out again into the snowy woods. The whole time we've been plotting/transitioning at HQ, we haven't seen The Sedges come in, so we think we've made up some time on them, and that only improves our already high spirits. 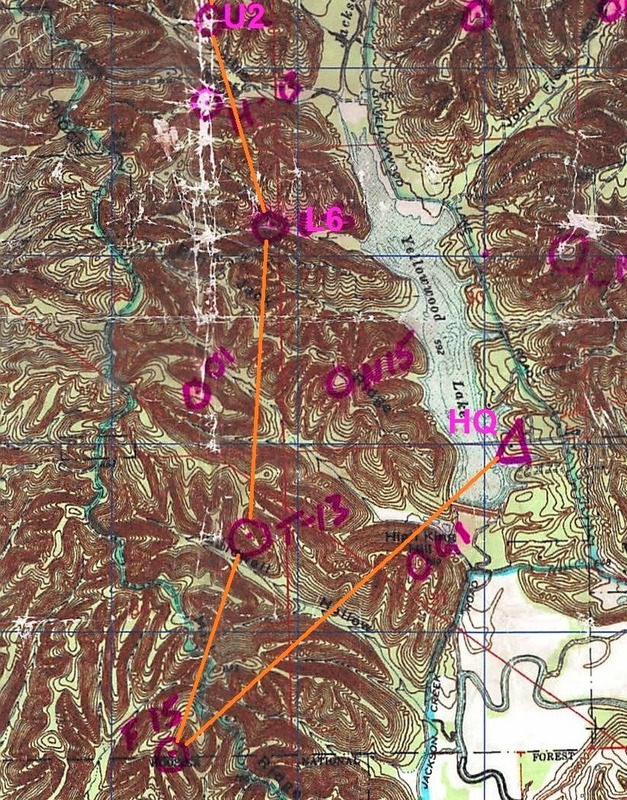 We attack J15 confidently with the specific clue "where the ridge flattens out". We are on a ridge. It is getting flatter. Except, no flag! We all canvass the area again, and gradually move up the ridge/spur. I finally spot the flag on a secondary spur, maybe 50m from where we plotted it. Relief! We punch and continue our way up the ridge, then onto the road towards the Fire/Water Station. A light snow has begun to fall and freshen up the 3-5" already on the ground. Rachel and Garrison, on a similarly steep hill, during last year's POCAR (no snow that year). We arrive at the Fire/Water Station and there are volunteers there! Awesome! Except, they're not quite sure what to do with us yet since we're the first team. We decide to run a quick out-n-back to K18 while they radio into HQ for instructions. When we get back, they're ready to go with a special challenge and 1 additional set of UTM coordinates. The volunteers ask us to nominate the most trustworthy member of our team and of course that's Jeff. He stands aside while Rachel, Mike, David and I are blindfolded (with our own hats) and tied together inside a loop of rope. Then Jeff is instructed to lead us around a bunch of trees, except he can't speak. We're all pretty used to crazy "special challenges" and this one is a piece of cake. Somehow the four of us inside the rope get stuck on Star Wars and make Darth Vader/Storm Trooper/Light Saber noises during the whole thing. 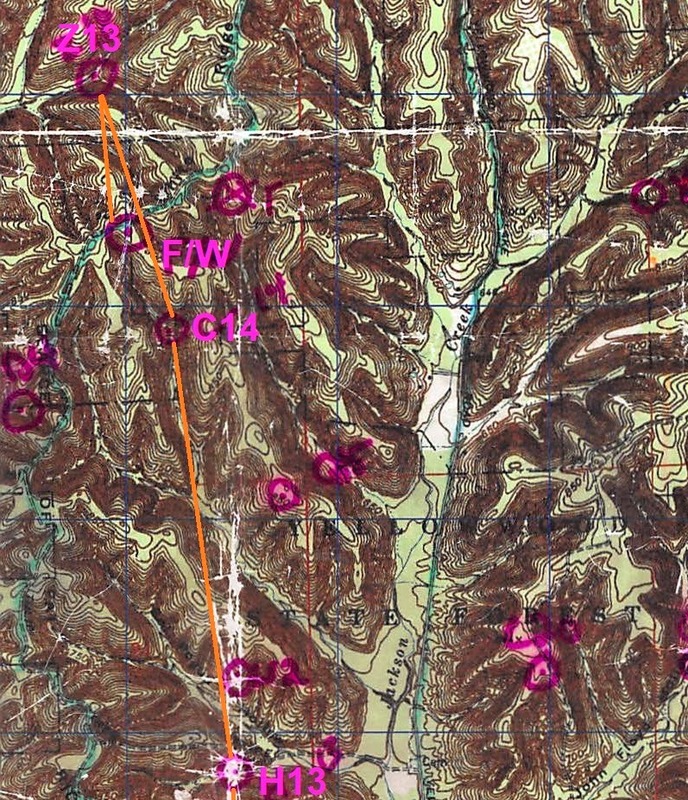 Jeff leads us through unscathed and we are rewarded with extra coordinates to C10. We plot it and run out of Fire/Water Station again without seeing any other teams. Awesome! Pretty much what our road run looked like. The initial run to V3 involves a lot of road and we make good time on it. Then it's into the woods for the final 1k along a mostly flat ridge for the punch. The next two controls, F16 and B14, are very accurately described by David as "down, then up, then down, then up", each of the downs and ups being 250-300 feet in a considerably short distance. I find myself a sturdy stick and it really helps with the climbing. On the descent after F16, I eat one of the sandwiches I packed (turkey-cheese-Boetje's mustard on a wrap). It's one of those "you know you're an adventure racer when" moments...half-running, half-sliding down a snowy, leafy 30% grade sounds like a GREAT time to eat a sandwich! And it's delicious! We have another similar descent to X6 as the snow continues to softly fall. The sun has set and the woods are starting to turn an increasingly deep shade of blue. It is very quiet and very beautiful. I feel lucky to get to experience this part of Indiana with these awesome people. We all take a few minutes to get our lights sorted at X6 and then decide to use the eastern road to attack the 3 remaining controls. The woods kept getting bluer and bluer. 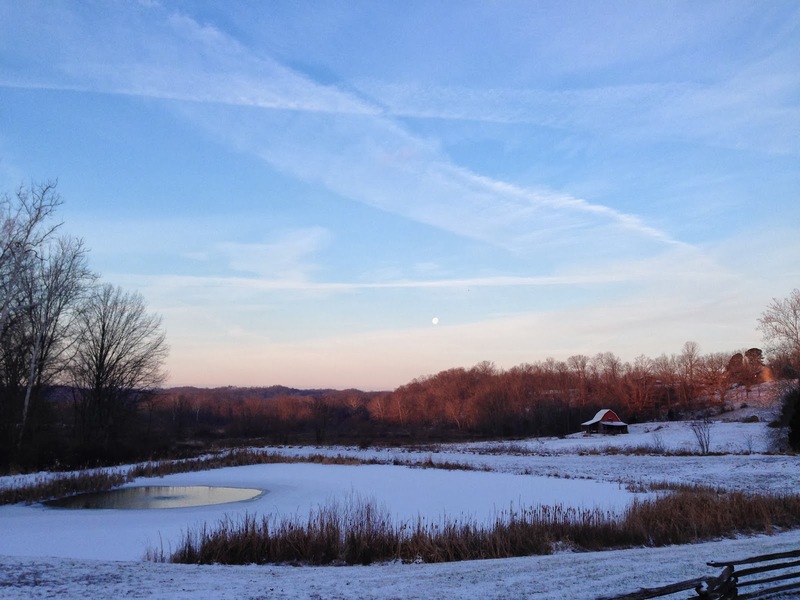 Once we pop out onto Dubois Ridge Road, we are all feeling good enough to run. We chat along happily and all of a sudden there is a team up ahead. Who could it be? The headlamps get closer, and we eventually discern that it's the Sedges! We did not expect to see them, but it looks like they're traveling in the opposite direction as we are, and that means we've got about a half-loop lead, which could be anywhere from 1-3 hours. Good news! We attack O15 cleanly and then use a super-safe high route to L20 since it's completely dark now and conservative, accurate nav is key. Then we gear ourselves up for one last big climb up to C10 (this is the checkpoint we were given coordinates to at the Fire/Water Station earlier this leg). On the way to C10, we continue to muse over the A9 checkpoint. At 3 of the previous checkpoints (K18, V3, and L20), a message has been included on the flag, reading "X marks the spot". We don't really know what this means, but are hoping that C10 will include some further instructions about A9. Leg 3, with "X marks the spot"
When we get to C10, there is another "X marks the spot" message, but nothing else about A9. Jeff thinks that we were supposed to punch A9 at the Fire/Water Station after completing the special challenge, but that the volunteers forgot to tell us that (remember, we were the first team there and they were not organized yet). I suggest drawing an "X" on the map between the 4 controls with messages and see where that puts us. So we all crowd around the map and draw in the "X". If we've plotted correctly, then the intersection is slightly north of a marked benchmark, but not near any other real feature (just a wide, flat ridge). But we're still not convinced that we need to physically go there. For all we know, the messages could just be a test and at the finish line, we could just be asked "which controls had special messages?". So we decide that we're done and it's time to return to Race HQ. We descend down the snowy spur and jog the road into the campground. We find the race director in the semi-heated shelter and we turn in our punchcard, proclaiming "We're done!" Um....no. We're not done. The race director shakes his head, saying "A9 is still out there. You need to go figure out where it is." Whaaa?? Of course our first guess is at the "X" intersection we just plotted, and we ask if we're right. The race director gives us a slight nod and, instead of letting us stew on our mis-interpretation of the race route, Jeff herds us out of the shelter and gets us re-focused on running an extra 5km out-n-back. BONUS MILES, MY FAVORITE!! We are on a mission, Jeff and Rachel especially. They lead us out at a fast run, retracing our steps up onto a steep doubletrack trail that we used to start this loop, several hours earlier. We all grunt up the hill, onto the main road, and then to the area where "X marks the spot". There is another team there, headlights on full force, bashing around. Our collective heart sinks when we discover it's The Sedges! They've made up a lot of time on us, even without our mistake, and now we are looking for presumably the same control together. The terrain is really subtle here, and we can't find anything resembling a checkpoint flag within 100m of where we plotted the "X". But Mattias' crew is still looking, too, so we all keep pushing farther and farther into the woods, hunting for the elusive checkpoint. Finally, one of the Sedges hollers out in an encouraging tone, and we latch on to their location and find the flag. Relief! We quickly gather our team back together and decide to try and run hard back to the finish, even though there's no way we can make up 30min in 2-3km. We find our way back to the road, back to the doubletrack trail, and back into the Race HQ with an acceptably completed passport. And then, we wait. No sign of the Sedges. 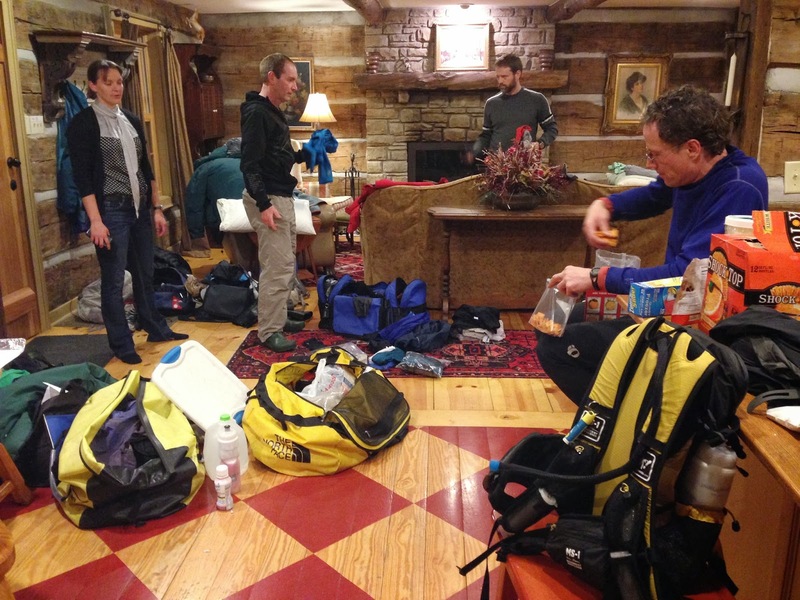 We all change into whatever dry layers we've carried and eat our remaining race food. David starts a countdown with 10 minutes to go, shouting out minute numbers and causing people to give him even more funny looks than normal. We have no idea why the Sedges are taking so long, but after a painfully slow interval, 30 minutes have passed and we're announced as the 2014 POCAR winners! We gather up all of our things and proceed to the parking lot to drive home. On the way we see The Sedges coming back into HQ, and they tell us that after the "X" checkpoint, they still had 2 more checkpoints left, plus they had a nav error. Oh, so that explains it! With our winning time of 11.5 hours, this is the shortest POCAR in recent memory, but none of us feel cheated from the lack of time in the woods. We have an amazing cabin just a few miles down the road, and more time to spend in it with our friends. There is even time for Garrison and me to drive into town and get PIZZA! And BEER! Want to get some weird stares? Find a Big Ten college town, go into a liquor store at 10:30pm on Saturday night, dressed in spandex and a puffy coat, with your headlamp still on, and buy some cider. Works even better if you're a guy. Try it sometime! More pre-race prep inside the cabin. Racing with the Alpine Shop boys is always a blast. We race hard, but we have a lot of fun while going fast. And racing WITH Bushwhacker, instead of against them, just amplified that dynamic two more teammates' worth. I absolutely loved everything about POCAR, even the confusing directions and mis-hung checkpoints. It's not meant to be world championships of the world. It's just a race that's put on by a bunch of motivated college students, bringing a great crowd into the winter woods, and spending quality time outside. I had the company of some amazing teammates, and I can't wait for next year! The view outside our cabin on race morning. Sounds like a fantastic time! And AR girl time, especially when it's with the kind of girl who's cool with spending that much time racing with boys, is pretty awesome. it was very fantastic! i treasure AR girl time. solidarity!